The residues upstream of this domain are the probable palmitoylation sites, particularly two cysteines. 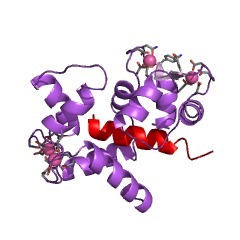 The domain has a putative PEST site at the very start that seems to be responsible for poly-ubiquitination PMID:8755249. PEST domains are polypeptide sequences enriched in proline (P), glutamic acid (E), serine (S) and threonine (T) that target proteins for rapid destruction. The whole domain, in conjunction with a C-terminal domain of the longer protein, is necessary for dimerisation of the whole protein PMID:18215622. This domain can be found in Disks large homologue 1 (DLG1 or SAP97), a membrane-associated guanylate kinase protein (MAGUK) that serves as an important determinant of localization and organisation of ion channels into specific plasma membrane domains [(PUBMED:18245566)]. The residues upstream of this domain are the probable palmitoylation sites, particularly two cysteines. 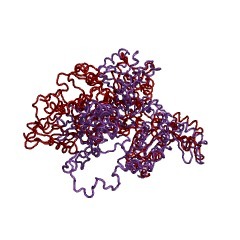 The domain has a putative PEST site at the very start that seems to be responsible for poly-ubiquitination [(PUBMED:8755249)]. PEST domains are polypeptide sequences enriched in proline (P), glutamic acid (E), serine (S) and threonine (T) that target proteins for rapid destruction. The whole domain, in conjunction with a C-terminal domain of the longer protein, is necessary for dimerisation of the whole protein [(PUBMED:18215622)]. There are 2836 MAGUK_N_PEST domains in 2831 proteins in SMART's nrdb database. Taxonomic distribution of proteins containing MAGUK_N_PEST domain. This tree includes only several representative species. The complete taxonomic breakdown of all proteins with MAGUK_N_PEST domain is also avaliable. Click on the protein counts, or double click on taxonomic names to display all proteins containing MAGUK_N_PEST domain in the selected taxonomic class. Molecular dissociation of the role of PSD-95 in regulating synaptic strength and LTD. The postsynaptic density protein PSD-95 influences synaptic AMPA receptor (AMPAR)content and may play a critical role in LTD. Here we demonstrate that the effectsof PSD-95 on AMPAR-mediated synaptic responses and LTD can be dissociated. Ourfindings suggest that N-terminal-domain-mediated dimerization is important forPSD-95's effect on basal synaptic AMPAR function, whereas the C-terminal SH(3)-GKdomains are also necessary for localizing PSD-95 to synapses. We identify PSD-95 point mutants (Q15A, E17R) that maintain PSD-95's influence on basal AMPARsynaptic responses yet block LTD. These point mutants increase the proteolysis ofPSD-95 within its N-terminal domain, resulting in a C-terminal fragment thatfunctions as a dominant negative likely by scavenging critical signaling proteinsrequired for LTD. Thus, the C-terminal portion of PSD-95 serves a dual function. It is required to localize PSD-95 at synapses and as a scaffold for signalingproteins that are required for LTD.
PEST sequences and regulation by proteolysis. In 1986, we proposed that polypeptide sequences enriched in proline (P), glutamicacid (E), serine (S) and threonine (T) target proteins for rapid destruction. Formuch of the past decade there were only sporadic experimental tests of thehypothesis. This situation changed markedly during the past two years with anumber of papers providing strong evidence that PEST regions do, in fact, serveas proteolytic signals. Here, we briefly review the properties of PEST regionsand some interesting examples of the conditional nature of such signals. Most of the article, however, focuses on recent experimental support for the hypothesisand on mechanisms responsible for the rapid degradation of proteins that contain PEST regions.